29 Jun 2011, 10:55 a.m.
28 Jun 2011, 10:53 a.m.
A provisional social calendar for the 2011/12 season has today been announced by Joint Social Secretaries Dan Frost & Fiona Booth Below is an outline of the proposed dates & events for the following season. 22 Jun 2011, 10:56 a.m.
It’s just 3 weeks until Hackney men’s pre-season begins on July 12th commencing 7.30 at Springhill and just six weeks until the women’s training begins on August 2nd. The emphasis throughout the sessions will be on core skills and scenario play in order to build on the attacking rugby that was the trademark of last season. Throughout the season every Tuesday will see a 90-120 minute session take place as in previous years with Springhill playing host. For the eight weeks following Christmas, once again, we will be utilising the 3G pitch at Mabley Green to avoid the muddy conditions. 17 Jun 2011, 10:59 a.m. In preparation for the 11/12 season, Hackney RFC has today confirmed that the committee has been finalised with some alterations from previous years. 15 Jun 2011, 10:58 a.m.
Hackney have confirmed that three ‘new’ faces will be joining the coaching team for the next season. 15 Jun 2011, 9:55 a.m. The RFUW has named 100 volunteers on a Roll of Honour, marking the start of National Volunteers Week and their contribution to growing the women's and girl's game across the UK. Hackney RFC is extremely proud to have two members named amongst the 10 Middlesex volunteers on the list. 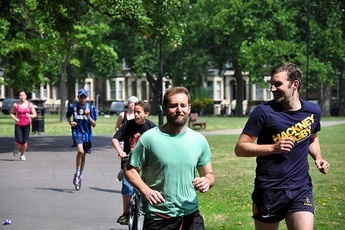 15 Jun 2011, 9:51 a.m.
Well done and thank you to everyone who took part in the Hackney 1000 on Saturday. It was a brilliant day. There was a god turn out from the club, especially the Gladies, and without the efforts of Hackney RFC the day wouldn't have happened. Special thanks have to go to Ollie Relph, James Dawson, James Hardwick, Ollie Hart, Mick Ryan, Rob Baker and AJ. Thanks fellas.